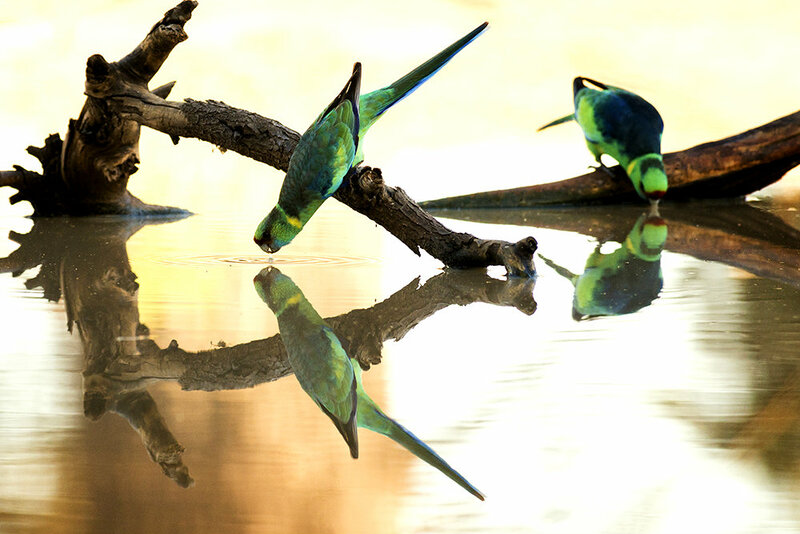 As the sun rises a pair of Australian ringneck parrots head to a local dam for a morning drink in Bowra Station, Queensland. Congratulations to this week’s AG Flickr group member Peter Taylor, for his image, ‘Australian ringneck parrots’. “During May 2014, I visited Bowra Station, an Australian Wildlife Conservancy property west of Cunnamulla, Queensland. The primary purpose of this visit was to see and hopefully photograph some of the extraordinary birds that call Bowra Station their home. Early one morning I set up a fairly crude hide constructed from an esky, spare clothing, and few branches beside a small dam not far from the homestead. One of the visitors to the dam that morning was a pair of Australian ringneck parrots (Barnardius zonarius), which after much wary watching, ventured out onto the submerged logs in the centre of the dam. The scene of the beautifully illuminated parrots drinking so gracefully is a sight I will hopefully never forget and cherish to the end of my days. Perhaps what I enjoy most about this image is the diffuse background forming a counterpoint to the water falling from the front parrot’s beak. via Australian ringneck parrots picture perfect – Australian Geographic. ← King Penguins on the Move. How enchanting! What a sight that would be!